Senate President and presidential aspirant of Peoples Democratic Party, PDP, Dr Bukola Saraki, yesterday, excited members of the party in Lagos as he assured them that he will do everything within his reach to ensure PDP produced the next governor of the state. 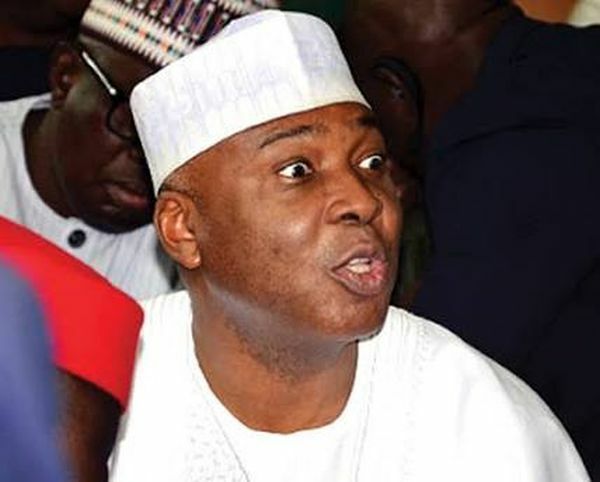 Saraki, who spoke at the PDP secretariat in Lagos State, where he was endorsed as favourite candidate, said he had the medicine of the man terrorizing Lagos State. He said: “What you have been fighting for many years, you will have it during the coming election because you now have somebody that has intention and charisma to deal with those disturbing you. Saraki warned Nigerians to be mindful of presidential aspirants promising to restructure Nigeria, if elected president. He said restructuring agenda was not something a president could single-handedly promise as it required the input of the legislature. He said: “Many aspirants will tell you that they will restructure Nigeria, but don’t let them deceive you because restructuring is not something only a president can do because certain laws also need to change. On unemployment, Saraki said no government could create enough jobs, stressing that it was only private sector that could do so. He said: “You need a president that can speak private sector language. So, this is the time to elect the right president to lead the country. “In Nigeria, we are at the crossroads and we need to save the soul of this country because we have not been so divided like we are currently across the country. In his response, Acting Chairman of Lagos State PDP, Alhaji Wali Hassan, assured the Senate President of their support, even as he commended him for the love he had for the party in Lagos. “As you can all see, he had his primary and secondary school education in Lagos and his wife is a Lagosian, so we are going to support him,” Hassan said. On his entourage were former Minister of State for Power, Alhaji Mohammed Wakili; immediate past governor of Kogi State, Captain Idris Wada; Dr. Doyin Okupe, former Senior Special Assistant on Public Affairs to former President Goodluck Jonathan; Senator representing Kogi West, Dino Melaye; and Chairman of the defunct nPDP, Kawu Baraje, among others. Meanwhile, while meeting with delegates in Abeokuta, Ogun State, Saraki described Nigeria under the control of President Muhammadu Buhari as a divided nation, where citizens don’t have a sense of belonging. He said: “Today in Nigeria, we are here at the crossroads. The country is divided and to unite the country, we need someone who will make everybody feel a sense of belonging. Today, there is no sense belonging in some parts of the country.